I’ve been looking around for my daughter’s first surfboard and there’s very little advice on buying surfboards for kids. If your child is under six there’s little point in buying them a proper surfboard, as they won’t be able to carry it to the shoreline and it‘ll be unwieldy in the water. So be patient, buy them a bodyboard to play with in the shorebreak or rock pools. There’s nothing on a bodyboard that will hurt them either. However my daughter did almost strangle herself on the leash after a nasty wipeout, so always beware. When your child is taller and used to waves, get a small softboard (also known as a foamy). I say small, because it helps if your child can carry it and control it in the water. The main advantage of softboards is in the name, they’re soft!. So they’re unlikely to hurt your child. The fins are rubbery so shouldn’t cause more than a bruise. If you rush things and start with a shortboard or bigger foamy, your child could get scared or hurt by the board once in the water. If your kid is keen, you could progress from softboard to proper surfboard in a summer. But it’s important not to rush things and go get a custom board made. Buoyancy and stability are still important. A fish or mini-mal will make a good beginner board, as they make catching waves easy, turn easier than a softboard and perhaps more importantly for a teenager – they look cool. When your heir is ripping with the rest of the them, it’s time to save up for best birthday present they’ll ever have. Their first full-on surfboard. Having had a good look around online for kids surfboards, I think BoardShop probably have the best range in the U.K. In the U.S. you’ll struggle to beat RTD Kids for their amazing range of children’s surfboards. I wish they had a U.K. distributor. As always check out your local surf shop, if you don’t use them we’ll lose them. If you have any top tips for buying a kids surfboard please add a comment below. Have you seen the kids surf boards on two bare feet? 47” with removable fin £19.99. I was thinking of getting them for my 5 and 7 year olds who have really got the hang of bodyboarding as well as skateboarding and want to try surfing.. do you think this could be a good way to get them started? My 7 year old is already pretty tall but I thought this might be better than a bigger board? …if you want kids to stand up with ease then a big foam board (over 7ft) is best. You’re going to need to help them get it out past the breaking waves and push them into the waves, as the board will be too big to handle and too wide to paddle on effectively. But it will give them the confidence they need to progress when they stand up with ease. Rather than getting frustrated and quitting with a smaller board. A lot of surf schools and hire places sell their old boards cheap at the end of summer. I know The Wave Project in Newquay has some ex-hire ones for £50. …if they your kids insist on doing everything themselves, then get the biggest foamy they can carry and manage in the waves. 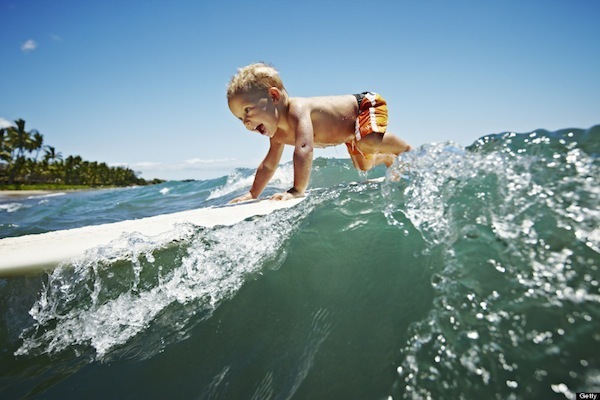 I think under 6’s can surf fine given the right board, TJ Barron was ripping when he was 5…. but I guess he is Hawaiian with much more access to warm water and perfect waves. A 7ft board is far too big for a small child under 8, I’d suggest 6ft max, and they should be able to stand with ease on that if not smaller, adults can and children are much more agile. I’ve been surfing 20 years and coached ISA level 2 and have worked with Wave Project too. Thanks for the info though, as you say not much online, I’m going to try one of the 2 Barefeet boards and see how he gets on, For £20 it’s worth a punt. Thanks for the comment and I think you’re probably right about big boards and small children. Anecdotally, I was surfing with my daughter at Watergate Bay on Sunday. There were two groups of small children learning, one with their Dad on six foot or smaller boards, the others were in a surf school on big blue and yellow foamies. Both were able to stand up on their boards. The big foamy looked easier and more stable to stand on but a nightmare to push through the waves. The smaller boards looked more manageable through the waves but were more wobbly when standing up. My daughter has started to get to her feet (on a 6ftish foam top) but she usually falls off quickly. Having said that she has mastered paddling through, turning and catching waves. So there’s definitely progress and hope. A thicker 5mm wetsuit has helped her stick at it for longer too, but that’s a different article. It’s actually pretty cool seeing kids, probably not this young, but 14+ learning about weight distribution and buoyancy for surfing. It’s pretty important information when choosing a surfboard. I agree, weight distribution and buoyancy are important especially as kids get older and progress. Another important factor is the type of waves they’ll be riding. Your waves in Australia tend to be more powerful than those we get in Cornwall so a bit more buoyancy helps.